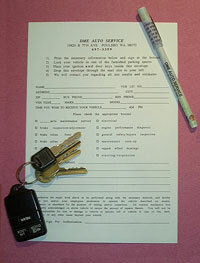 Should you need to utilize our key drop system, just park your vehicle in one of the parking spaces provided in the front of our facility, simply complete and sign one of our key envelopes, insert your door and ignition keys into the envelope, and drop the envelope through the door slot in the front door. Please make sure that you have written any special instructions and have included a phone number where we will be able to contact you when we need to. We will take care of the rest. We will be contacting you on the morning we receive the envelope to confirm with you that we have received your vehicle and your keys and to discuss with you your requests and concerns with your vehicle. Key envelopes are located outside and to the left of our front office door in a black mailbox. Along with the envelopes you will find extra pens and business cards. NOTE: If your vehicle has an alarm system, please inform us as to the correct operation and disarming procedures.